Notice that it is same as linear interpolation formula. Also note that 2D line equation is frequently represented with slope-intercept form or standard form . However these forms are not suitable for computer algorithms; the slope of a vertical line is undefined (±∞), and these forms cannot be used in 3D space. 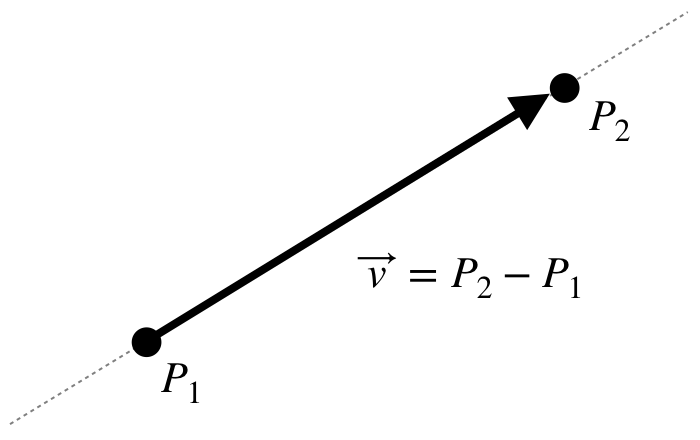 The intersection point of 2 lines is solving the linear system of 2 lines using vector algebra. First, solve the linear system, Line1 = Line2 for t. Then substitute t into Line1 equation to find the intersection point (x, y, z). Here is an extra explanation of vector division (divide by ) in the last line of the above equation. 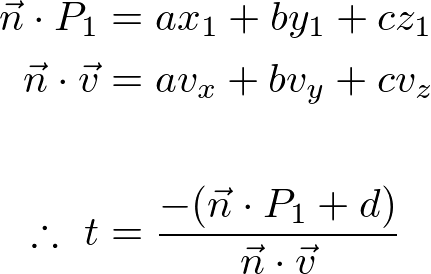 The cross products and are also vectors, so we let them and respectively to simplify the equation above. Therefore, division by on both sides is dividing each element of the vector by . Then pick any element to find t as long as the denominator is not zero. Here is C++ code to find the intersection point of 2 lines. Please see the details in Line.cpp. 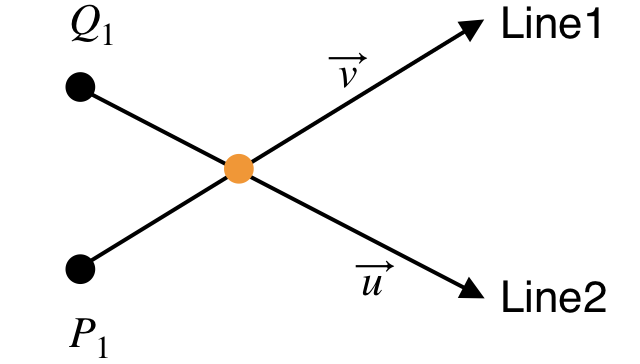 The following interactive demo is finding the intersection point from 2 lines in 2D. It requires WebGL enabled browsers. Please refer to Plane Equation to see how to derive the plane equation. Finding the intersection point of line and plane is solving a linear system of a line and plane. 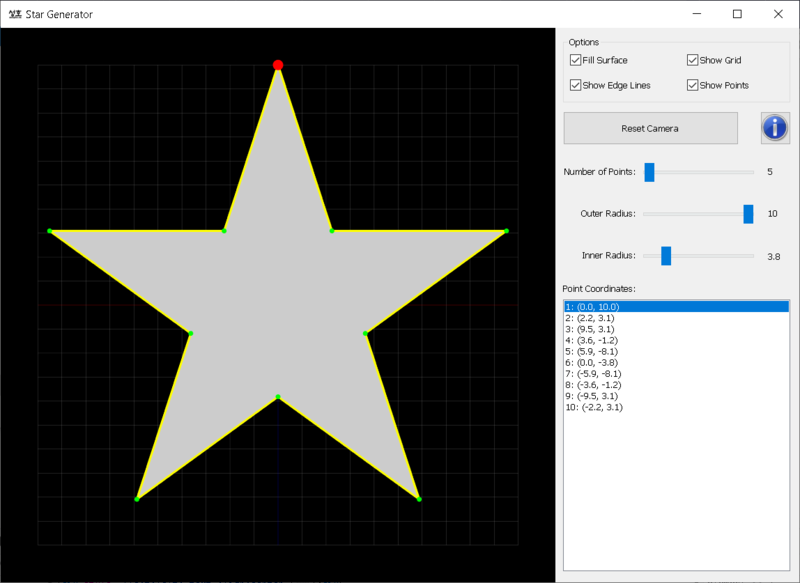 Here is C++ code to find the intersection point of a line and a plane. 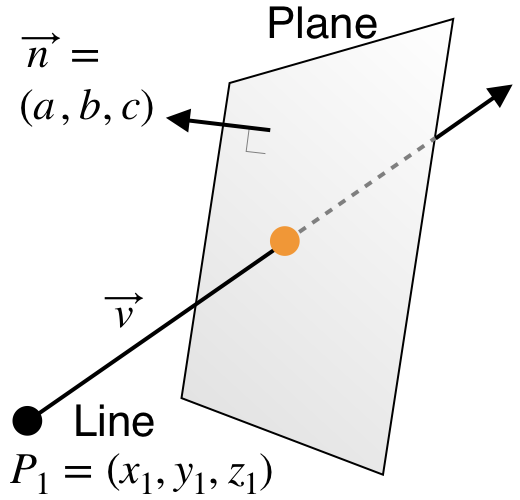 The following interactive demo is finding the intersection point from a line and a plane in 3D. Use left and right mouse buttons to rotate the view, or to zoom in and out. It requires WebGL enabled browsers. Define the top outer point with a given radius, for example, if the radius is 10, then the top point will be (0, 10). 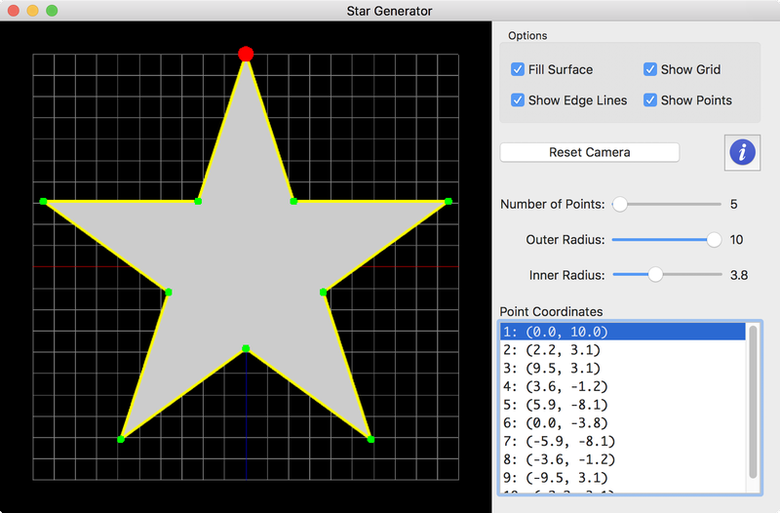 Compute the other outer points by rotating the top point by N / 360 degree repeatedly, for example, 72 degree for 5-point star. 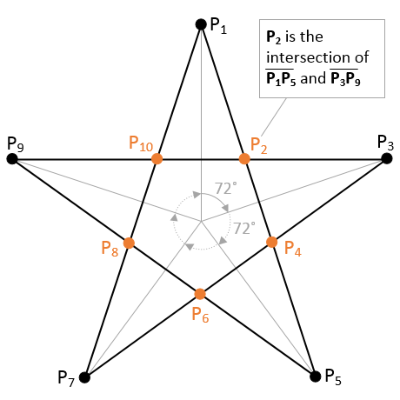 Find inner points which are intersection points from the lines by connecting the outer points.